The parking nearest to Shaw Centre is a 2-storey underground facility providing 730 spaces. It is a fully-staffed facility with two entrances located on Daly Avenue and Nicholas Street South. The three exits are located on Nicholas Street South. 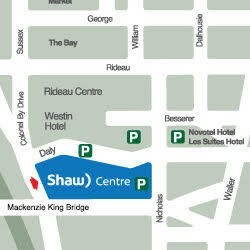 Entry points to both the Shaw Centre and the Rideau Centre shopping complex are located on both levels on the north and west walls. There are four handicap spaces per level located on the north wall near the Rideau Centre entrances. The parking is a fully-automated multi-level facility. There is an ambassador patrolling the pay stations and entry and exit points on a 24-hour basis.